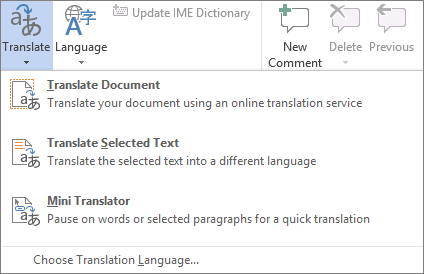 The Translate feature is currently available for Word, Excel, OneNote, and PowerPoint. You can get a translator add-in for Outlook in the Office store. 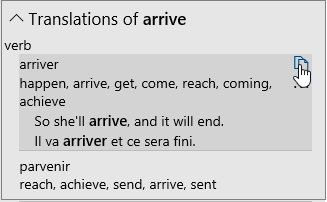 See Translator for Outlook for more information. Note: In Excel, there is no Insert button, you'll have to copy/paste the text you highlighted in step1. You might see a list of several translations. Expand the translated item to show a usage example in both languages. Choose the one you want and click Copy. This feature﻿ is available to Office 365 subscribers using Version 1710 or higher of Word; or Version 1803 or higher of PowerPoint or Excel. You must also be connected to the internet, and have Office Intelligent services to use Translator. Users with Office 2016, but without a subscription, will have the same translation features that are available in Office 2013 and earlier. Subscribers get new features and improvements monthly. Click to try or buy a subscription. Not sure what version of Office you're running? See What version of Office am I using? Select Review > Translate > Translate Document. This feature﻿ is available to Office 365 subscribers using Version 1710 or higher of Word. You must also be connected to the internet, and have Office Intelligent services to use Translator. In your notes highlight the text you want to translate. Select View > Translate > Selection. Select View > Translate > Page. Select Translate. The translated page will be added as a sub-page of the existing page. 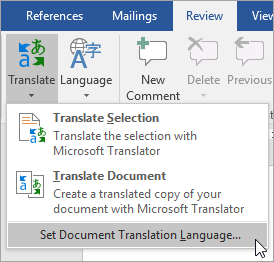 If you later want to change the To language for document translation, or if you need to translate a document to more than one language, you can do so, by selecting Set Document Translation Language...from the Translate menu. Translate Document/Translate Item: Word, Outlook. Translate Selected Text: Word, Outlook, OneNote, PowerPoint, Publisher, Excel, Visio. 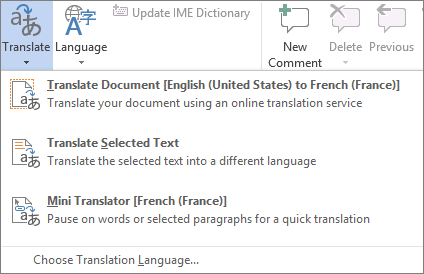 You can have an entire Word document or Outlook message translated by a computer ("machine translation") and displayed in a web browser. When you choose this kind of translation, the content in your file is sent over the Internet to a service provider. Note: Machine translation is helpful for conveying the basic subject matter of the content and for confirming whether the content is relevant to you. For high accuracy or sensitive files, human translation is recommended, because machine translation might not preserve the full meaning and tone of the text. On the Review tab, in the Language group, click Translate > Choose Translation Language. On the Review tab, in the Language group, click Translate. 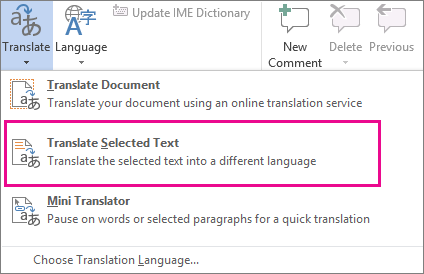 Click Translate Document (Translate Item in Outlook). The From and To languages that you selected are listed. A browser tab opens with your file in both the original language and the language that you selected for translation. 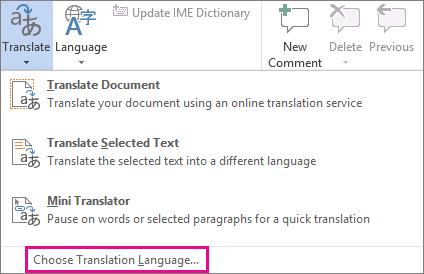 Note: If this is the first time you have used translation services, you may need to click OK to install the bilingual dictionaries and enable the translation service through the Research pane. You can also see which bilingual dictionaries and machine translation services you have enabled by clicking the Translation options link in the Research pane. 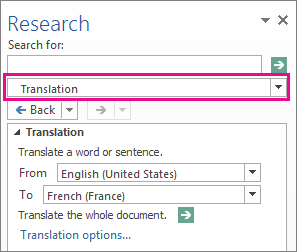 See Translate selected text to learn how to access the Research pane. You can use the Research pane to translate a phrase, sentence, or paragraph into several selected language pairs in the following Microsoft Office programs: Excel, OneNote, Outlook, PowerPoint, Publisher, Visio, and Word. Note: In PowerPoint, only one slide's text box can be translated at a time. On the Review tab, in the Language group, click Translate > Translate Selected Text to open the Research pane. Note: In Word, you can right-click anywhere in the document, and then click Translate. Select the words, press ALT, and then click the selection. The results appear in the Research pane under Translation. Type the word or phrase in the Search for box, and then press Enter. You can also see which bilingual dictionaries and machine translation services you have enabled by clicking the Translation options link in the Research pane. To change the languages that are used for translation, in the Research pane, under Translation, select the languages that you want to translate from and to. For example, to translate English to French, click English in the From list and French in the To list. To customize which resources are used for translation, click Translation options, and then select the options that you want. In Word, Outlook, PowerPoint, and OneNote, the Mini Translator displays the translation of one word as you point at it with your cursor. You can also copy the translated text to the Clipboard, paste it into another document, or play a pronunciation of the translated word. On the Review tab, in the Language group, click Translate > Mini Translator. Point to a word or phrase that you want translated with your mouse. When a faint dialog box appears overlayed in your document, move your mouse over it to see any translations available. Note: The Mini Translator will continue to appear whenever you move over words. To turn it off, repeat step 1 above. To translate text directly in a browser, you can use Bing Translator. Powered by Microsoft Translator, the site provides free translation to and from 50+ languages. To learn more, see Translating text using Translator. This feature is only available if you have an Office 365 subscription, or Office 2019 for Mac, and only for Word, Excel, and PowerPoint. 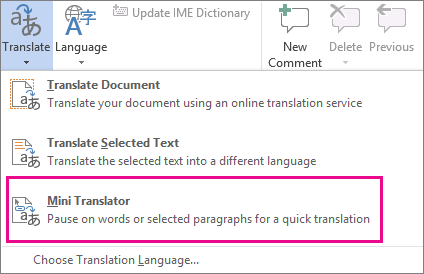 For Translator in Outlook see Translator for Outlook for more information. In your document, highlight the text you want to translate. Select Review > Translate > Translate Selection.